Toyota called it its “finest engine,” ambitious, technologically advanced and, from a modern perspective, impossibly strange. And yet few Americans ever knew it existed: the 1G, a 2.0-liter straight six that’s more interesting than you might imagine. Now, we Americans are quite familiar with the later straight six, the 3.0-liter Toyota 2JZ. It’s one of the most legendary engines of all time, giving the world stories of thousand-horsepower Supras thanks to modern tech and a super-tough iron block. But before the 2JZ there was the 1JZ, and before the 1JZ was the 1G-GTE, the first twin-cam twin-turbo production engine from any Japanese manufacturer. Now, if the 1JZ is the father of the 2JZ, then the 1G is its grandfather. I guess you could argue that the 1JZ is like an older brother to the 2JZ, in which case the 1G would be its dad, or maybe its uncle, but that’s really getting away from things. Engines do not sire other engines. They cannot reproduce, no matter how many times I try to get my VW Beetle to make me another flat four. More than that, the 1G-GTE and the series of 1G-G engines are weird and relevant in their own right. The one that got things going. Note the variable-induction intake up there with two runners per cylinder. The first thing that’s hard to grasp, particularly for an American, is why Toyota built a two-liter straight six in the first place. Six cylinders are usually reserved for three liters and up over here. It seems pointless to go after that kind of complexity in a displacement where a four-cylinder would do. But Toyota is a conservative company, and it doesn’t do anything without a lot of justification. In this case, we have taxes to thank. Japan taxes cars in classes based on how big they are and how large their engines are. Up through the end of the 1980s, that structure was basically little cars with tiny engines (kei cars), full-size cars with engines over two liters (large cars) and then everything else in between. Seriously, it was punitive. Sales of cars with larger than 2.0-liter engines only accounted for 4.5 percent of the market in Japan even at the peak of the Bubble Era, as noted in the March 1989 issue of Japanese Motor Business I dug up at my old university library. Cars with engines between 551cc and 2000cc were a vast 91.4 percent of the market, leaving everything else to little 550cc-and-down kei cars. That is to say, if you wanted to sell a car in Japan in the ‘80s, you didn’t want the engine to be that big, even if it was something meant to be prestigious, like a straight-six luxury car. Hence the 1G’s size in spite of its cylinder count. What made the 1G really interesting is that the Japanese market was crazy competitive back in the ‘80s, with a real sales war between the two top manufacturers, Toyota and Nissan. If one of them so much as opened up a new dealership in Tokyo in the ‘80s, it made the news in business journals. 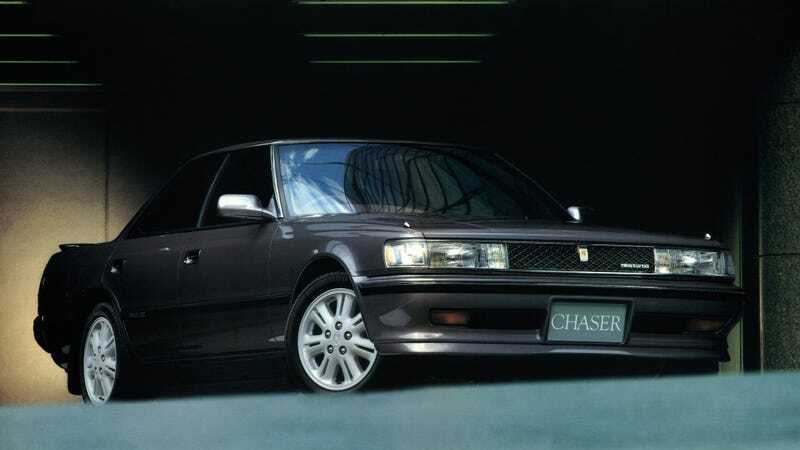 Much of the attention was focused on bolstering the more affordable 2000 series, which we presume accounted for much of the Soarer’s total sales volume. The 2800GT was faster, but the higher tax rates made it much more expensive to own than the 2-liter cars. This is all to say that thanks to strong competition for any Japanese car and heavy taxes on cars with engines over two liters, Toyota threw everything it had at this relatively small straight six. Well, not just Toyota. This was also a Yamaha engine. Yamaha is a magic word for anyone familiar with the inner workings of Toyota. The two companies have had a very close relationship over the years, and a lot of Toyota’s best engines were either designed by, built by, or designed in partnership with Yamaha. The screaming V10 in the Lexus LFA? Yamaha. The glorious straight six in the original Toyota 2000GT? Yamaha. The legendary four-cylinder 4A-GE in the AE86? Yamaha once more. Even the 1JZ was a partnership between Toyota and Yamaha, and the great 2JZ was Toyota taking Yamaha’s work up a step in size. And the 1G-GE was another interesting engine from this pairing. It was Toyota’s first engine with four valves per cylinder, it had a variable intake system, dual-overhead cams, then a supercharger and then Japan’s first twin-turbo production engine. The 1G Twin Cam 24, a 1G-GEU type, 6-cylinder 1988 cc engine, is an extremely advanced powerplant offering true GT performance with its DOHC and 24-valve arrangement, which provides two intake and exhaust valves for each of its six cylinders. The engine is rated at 160 horsepower at 6,400 rpm, which makes it the most powerful Japanese engine in its class. Torque is an impressive 18.5 kg-m at 5,200 rpm. But remember that this was all a back-and-forth. After all, Nissan had really beaten Toyota to making a good four-valve 2.0-liter performance engine with the four-cylinder FJ20 a year earlier, the engine that really kicked off the modern Japanese performance car era. Toyota had to regain some pride in the twin cam arena. Toyota boosted the 1G-GE a few short years after it first hit the market, the 1G-GTE, in 1985. Yamaha claims it was the first twin cam twin-turbo production engine from Japan, the engine’s Wikipedia entry puts it as Japan’s first twin-turbo production engine altogether. It first put out 185 horsepower, then 210 with an air-to-air intercooler. The first car it went into was the GX71 Mark II/Cresta/Chaser 2000 GT Twin Turbo S above. Toyota published a whole brochure on the twin cam in ‘83. This is just one page. Also, Toyota claimed that the FX-1 prototype engine had variable valve timing and cylinder deactivation, which would have made it about three decades ahead of its time. But even more interesting is the supercharged version that came out just before it, the 1G-GZE. I mean, I shouldn’t be quite as amazed about this engine as I am. This was a company that later made a supercharged mid-engine minivan, after all. Making, as Toyota claims, Japan’s first supercharged straight six isn’t beyond belief. And again, it seems bizarre now that Toyota would make such an oddball, but back in the ‘80s the market supported it. Was it that great of a performance engine? Not really, as Myron Vernis, explained to me. He daily drives a car with the 1G-GZE, an imported 1990 Toyota Mark II Grandé Super Charger, and it’s apparently mostly suited for luxury duty. Though it’s not a huge vehicle, Myron’s Mark II was a techy car as a whole, with ABS, electronic stability control and adjustable shocks in addition to a digital dash, retractable HVAC controls and side window wipers. Does your car have side window wipers? I didn’t think so. In this kind of context, a small supercharged straight six fits right in. By the end of the 1980s, Toyota and Yamaha replaced the 1G with the 1JZ, breaking through the two-liter barrier into 2.5 liters, then the 2JZ at a full 3.0. The JZ we got in America and built upon the 1G to become the tuner’s engine of choice, leaving the 1G behind. I looked at a bunch of forums to try to find people tuning 1Gs and the most common advice was to just buy a 2JZ and jam that in. It’s a better, more modern engine free from the 1G’s size restrictions. So though the 1G has become obsolete and to some degree forgotten, it shows the intensity of the Bubble Era in which it was born. It might not be the most powerful engine, but it’s one of the more interesting projects from the time when, in the Japanese auto industry, no solution was too strange, no project was too ambitious.